1995 Babys First Christmas - Magic! 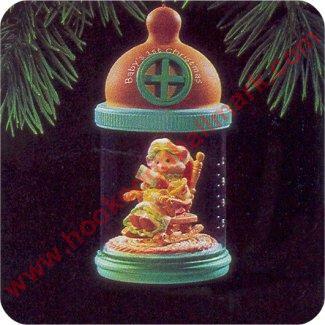 Home > Hallmark Ornaments By Year > 1995 Hallmark Ornaments > 1995 Babys First Christmas - Magic! This lighted ornament is shaped like a baby bottle. The rocking chair rocks and plays "Rock-A-Bye Baby"
To start motion, turn switch. To stop motion, turn switch again.